As a dad, you want to ensure that your children are leading a healthy and active lifestyle. However, with the rise in popularity of junk food and fast food in recent years, getting kids to eat right has never been more challenging – leading to a fitness epidemic plaguing America's youth. In fact, the Centers for Disease Control reports that obesity in children ages 6 to 11 has jumped from 7 percent in 1980 to nearly 20 percent in 2008. Similarly, the number of overweight children aged 12 to 19 years increased from five percent to 18 percent in the same time frame. Because of this, monitoring the eating habits of your children has become increasingly important for today's parents. And, establishing wholesome snacking habits can play a major role in your young children's health for the rest of their lives. While you can't monitor your kids' eating routines at school, you can certainly use that information to help decide what they consume at home. 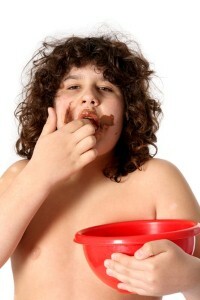 Young children generally eat a midday snack at school in addition to lunch, while teenagers usually only eat one meal. If you tend to sit down for dinner on the early side, provide lighter snacks like crackers, nuts, vegetables and fruit along with water to hold them over. For families that eat later in the evening due to demanding work schedules, consider something slightly more filling like hummus or small sandwiches. If the only snacks in your house are chips, cookies, candy and soft drinks, then that's what your children are going to want when they get home. You don't have to completely eliminate these treats from your pantry, but compromise by buying healthier, alternative snack options like baked chips, sugar-free iced tea or whole grain vegetable crackers. By setting this precedent in your home, you'll help kids make good dietary decision that will help them lead long and healthy lives.